Virtual resources are a unique resource type.Each resource instance belongs to only one resource type. For example, the resource instance Market News Page would belong to the Content Nodes resource type. Following virtual resources are of my interest recently while working on security setup (These are so useful for the initial security setup with combination of role blocks). The root node of all pages, labels, and external URLs. Pages contain the content that determines the portal navigation hierarchy. If a new top-level page is created, it is automatically a child resource of the Pages virtual resource. If a new page is created beneath an existing page, the new page is automatically child of the existing page. Pages inherit access control configuration from their parent page unless role blocks are used. 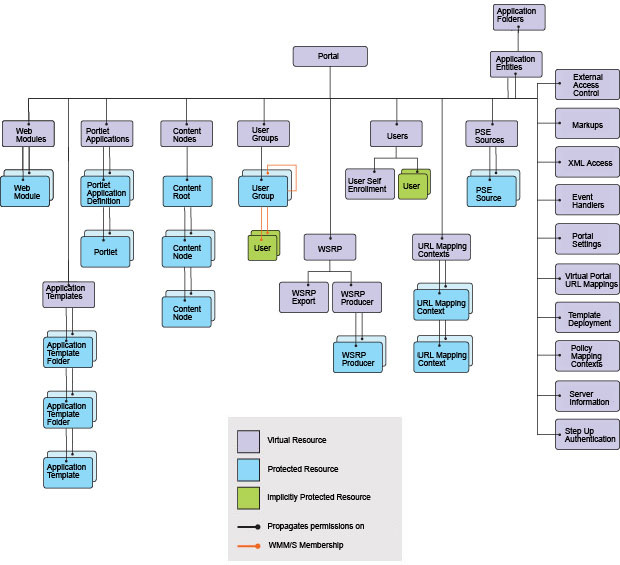 This is the root node of all resources in the release domain. Roles on this resource affect all other resources in the release domain by default through inheritance unless role blocks are used. Resources in other domains like Templates and Policies are not affected through role mappings on this resource. Use page-based access control to delegate access control of content items to the web content page used to display the content. Protects portal settings that can be modified through the Portal Settings Portlet or the XML configuration interface. This virtual resource has no child resources. The root node of all installed portlet applications. Portlet applications are the parent containers for portlets. If a new Web module is installed, the portlet applications that are contained within that Web module are automatically child resources of the Portlet Applications virtual resource. Portlets that are contained within a portlet application appear as child nodes of that portlet application. Thus a two-layer hierarchy consisting of portlet applications and the corresponding portlets exists beneath the Portlet Applications virtual resource. Portlets inherit access control configuration from their parent portlet applications unless role blocks are used. The root node of all search collections. If a new search collection is created, it is automatically a child of this virtual resource. Roles on this resource affect all defined search collections unless role blocks are used. The root node of all URL mapping contexts. URL mapping contexts are user-defined definitions of URL spaces that map to portal content. If a new top-level URL mapping context is created, it is automatically a child resource of the URL Mapping Contexts virtual resource. If a new URL mapping context is created beneath an existing context, the new context is automatically a child of the existing context. URL mapping contexts inherit access control configuration from their parent context unless role blocks are used. The root node of all user groups. Each user group in the portal inherits its access control configuration from the User Groups virtual resource. It is not possible to create role blocks on individual user groups. Protects the Selfcare and User Enrollment facilities (sign up and Edit My Profile). This virtual resource has no child resources. This virtual resource has no child resources. The Users virtual resource protects sensitive operations that deal with user management. For example, in order to add a user to a user group, you must have the Security Administrator@Users role. Users are implicitly protected resources. Users cannot be protected individually, but only through their group membership. As a result, it is not possible to have a role assignment on a specific user. Roles must be on user groups instead. So, you can edit Mary's user profile if you have a role assignment on some user group to which Mary belongs. Protects the ability to modify a URL Mapping linked to a virtual portal. The root node of all Web modules. Web modules are portlet WAR files that are installed on WebSphere Application Server. Web modules can contain multiple portlet applications. If a new Web module is installed, it is automatically a child of the Web Modules virtual resource. Roles on this resource affect all child resources (all installed Web modules) unless role blocks are used. Protects the ability to execute XML configuration interface scripts. This virtual resource has no child resources. Protects the ability to modify the binding of resources such as Portlets or Pages to an authentication level. Lets users update and modify the portal theme. Note: Role inheritance never crosses domain(release,JCR,community,customization) boundaries, thus limiting the inheritance scope. Therefore, a role assignment for a user on the Content Nodes virtual resource in the release domain will only grant access to Content Nodes resources (pages) in the release domain. Resources can appear in different domains depending on the type of resource.